ASPIRE55 is offering free 10 weeks of strength training workout sessions (valued at $750) for members who are interested to be part of a research trial to measure the benefits of strength training to older adults, particularly for less active older adults. are not involved in regular group exercise/ workout routine. 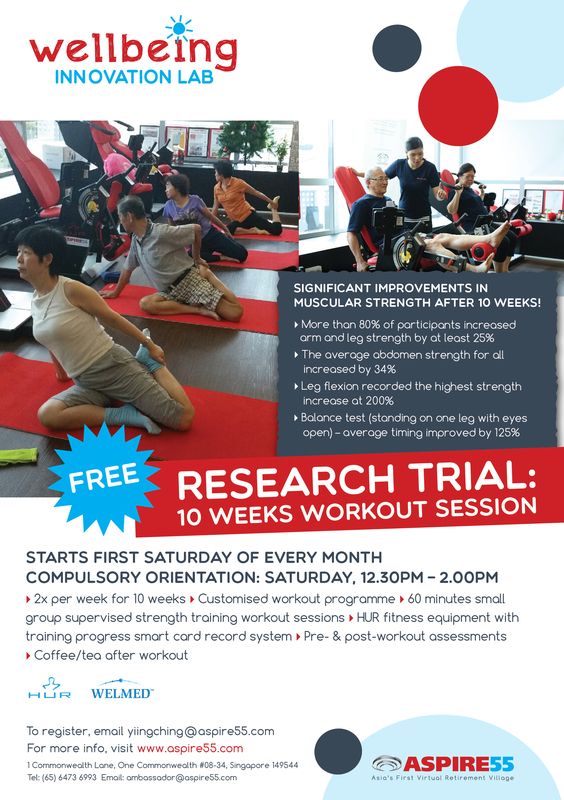 This research trial will start from 28 March to 4 June 2016 (10 weeks) and participants are required to commit to attending workout sessions twice a week for 10 weeks. Registered participants are required to attend a compulsory Orientation on 12 March 2016, 12.30 - 2.00 pm at ASPIRE55 Wellbeing Innovation Lab, One Commonwealth. Be part of this exciting programme - workout with your friends and/ or spouse and experience the benefits of strength training and be 'stronger as you age'. Have coffee or tea after each workout sessions and chit chat with new friends/ workout mates. The registration is only open to members who did not sign up earlier to be part of the earlier batches of the Research Trial or participated in other free trials offered. If you are unable to commit your time for twice a week workout session for the stipulated 10 weeks, please allow others to register instead, as we have limited slots available.